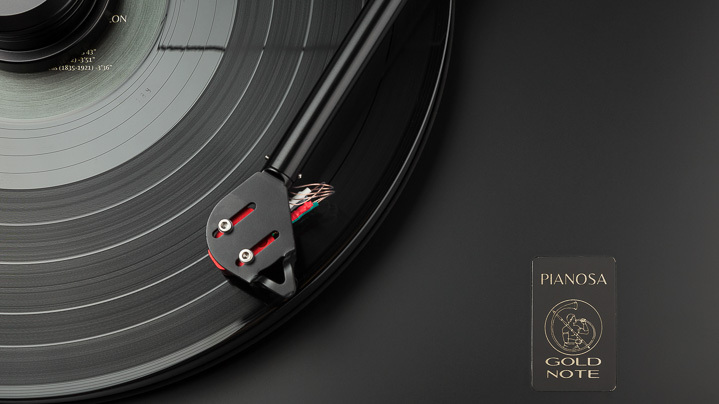 The Italian company Gold Note has a seven-strong range of turntables, although two are limited edition, made-to-order, super-high-end extravaganzas. Of the five main turntables in the company’s range, the Pianosa hits dead centre, with the two Valore models below and the Giglio and Mediterrano above. The Gold Note models eschew the hair-shirt approach of many modern audiophile turntable designs. It seems many designers forget that, while the worst excesses of audio ugly can be hidden from view in cabinets and the like, a turntable is almost always on show, so it better look pretty good. It’s also a potential dust magnet, and Gold Note is one of the few higher end brands who supplies a dust cover these days. The lines are simple, classic, and elegant. It’s a simple poly-vinyl coated platter with a simple arm, on an elegant black lacquered MDF plinth, which sits atop a curvy lower plinth finished in walnut, black lacquer or white lacquer. the metalwork is black as standard, but can be anodised silver if requested. It features a round belt that encircles the platter, with a decoupled motor housing sitting quasi-independently on its own base to the back left of the deck. Speed and start-up are controlled by two buttons on the front-left. The deck sits on three adjustable conical feet and comes supplied with the brand’s easy to use 9” B-5.1 gimballed tonearm as standard. While its ‘wall-wart’ switching power supply may seem under-sized for a turntable of the Pianosa’s price, there are some very good reasons why it was chosen: the power is generated and handled outside the turntable’s chassis so there are no parts of the power supply placed inside it. The results achievable with a large linear power supply – as featured on other decks of the same price – could theoretically deliver slightly better performance but Gold Note took a ‘smart’ approach: it started designing a frictionless and high-efficiency synchronous motor, then an effective decoupling mount for the motor and finally developed the electronic controls in order to deliver the right amount of torque, power, and stability. Far from being under-powered, in fact the switching power supply currently used is actually ‘over-sized’ resulting in more power than needed to drive the turntable under optimal conditions. And, while those optimal conditions are the test bench, in reality many turntables lead a sheltered life and will be close to optimal conditions in the home. However, this approach is a different from the standard: Gold Note tailors the motor and the electronics to each turntable’s needs, while developing a standard power supply for all its decks. It’s similar to the philosophy of Alfa Romeo and Lotus: instead of using humongous motors and power, these cars are designed to be efficient and precise. “Simplify, then add lightness,” as Lotus founder Colin Chapman was wont to say. This also means Gold Note can install all the mechanical/electronic parts on board to achieve a more compact design of the deck (obtaining a much higher density at the same time) by simply moving the power supply away from the deck itself. The motor is decoupled from the chassis through elastomer material thus acting as a floating element, which is also calibrated differently for each turntable in order to perfectly match the materials used for the chassis.